Halloween is such a fantastic holiday. It’s the only day of the year when it’s socially acceptable to dress up in costumes and eat as much candy as you want… man I wish it was Halloween everyday! Even though you may love Halloween, many times we fail to realize that it can actually be a very dangerous time for our 4-legged friends. 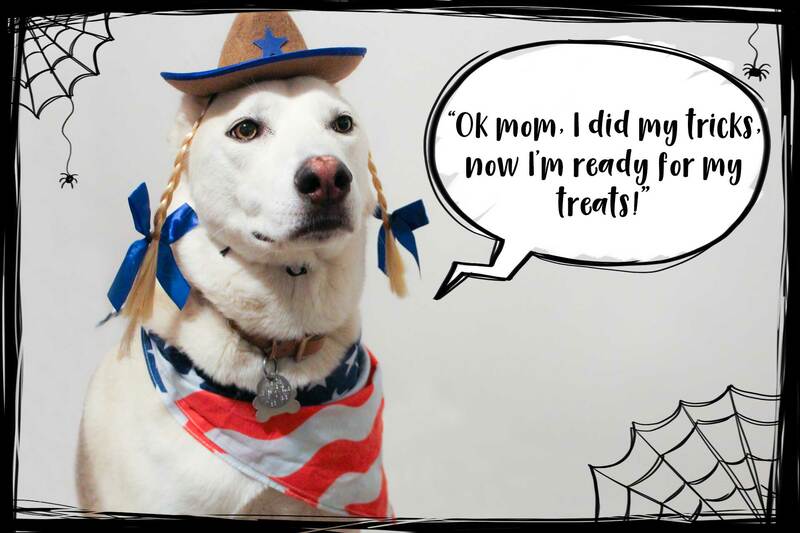 All of the scary costumes, loud noises and dangerous foods can really put our dogs in danger… and none of us want that! There are appropriate and safe ways for you to enjoy this spooky holiday with your pup… you just have to make sure that everyone is as safe and comfortable as possible! Here are 4 major pet safety threats you should consider before this wonderful October holiday rolls around. Keep those paws out of the candy dish! We all know that chocolate is toxic to our furry friends. Still, many times we fail to take the proper precautions and make sure that our Halloween treats are out of Fido’s reach. I mean, the candy bowl is just sitting by your front door, your pup may not have the self control to resist taking a bite of those goodies. Not only that, but many young children aren’t careful about what they feed to dogs. They may try to give a dog some candy without even realizing that their favorite chocolate bar isn’t a suitable snack for animals. To help keep your dog away from those dangerous treats, make sure to have the candy bowl up high in a safe spot at all times (hey, that might even help keep it away from kids, too!). Also, take the time to inform everyone in your home about the dangers of Fido getting into the Halloween candy. If your little buddy keeps begging for a snack and flashing those puppy dog eyes, you could always whip them up a healthy treat to satisfy their sweet tooth! Try making a batch of our Pumpkin Spice Dog Truffle Treats (Hyperlink to post). They’re healthy, dog approved, and still festive. There’s really nothing cuter than a dog dressed up for Halloween. I love to come up with creative ideas for my family’s Halloween costume… and incorporating Meeka is one of the best parts! However, you have to be very careful if you choose to dress up your pup for Halloween. Make sure that their costume is secure, but not strangling. If there is any part of it that could be a potential choke hazard please stay clear of it! Also, if you are making the costume yourself, double check that all of the costume material is dog-friendly and dog-safe. Don’t use anything with glitter, small pieces, or anything that could be dangerous for your pup to chew on. Another thing you want to check on is how your dog feels in the costume. If they really feel out of place and uncomfortable, it can cause them a lot of anxiety. If your pup seems to be in distress while wearing their costume, PLEASE take it off of them, no matter how cute they may look. This can be a scary one, and my family had to find it out the hard way. On Meeka’s first Halloween she was just short of a year old and we took her out into the yard on a leash that night. She seemed to be ok with all of the families passing by, but then something scary happened. A group of children dressed in costumes approached the house and Meeka went crazy! We couldn’t figure out why at first, but then it clicked: they were wearing masks! Meeka couldn’t see their faces, and that did not sit right with her. Luckily we were able to pull her back inside before anything got out of control and this experience taught us a valuable lesson. If you or a loved one is planning on wearing a mask as a part of their Halloween costume this year, try getting your dog used to it first. Let them sniff it while it’s not on your face and see how they react when you put it on. If they seem to be ok with it, go ahead and wear it, but be extra cautious not to make any really quick or scary movements while you are wearing it. And, if you dog seems any bit afraid of it, please do not wear it around them. Making them feel comfortable is key to everyone’s safety. Caleb and I decorate our house for two holidays: Christmas and Halloween. We go all out for these holidays, and man does our house look good! However, we always make sure to think about Meeka when we pick out and put up decorations. Just like your dog’s costume shouldn’t include any glitter or small, easy-to-swallow pieces, neither should your home decorations. Even though they may make your home look good, decorations like glitter pumpkins and sparkly spiders can pose a health threat to your dog if ingested. Also, if you have a chewer, be careful about those spider web decorations. Those stringy webs can wreak havoc on your dog’s digestive system. Do you like burning yummy pumpkin-scented candles? Make sure to keep them out of your dog’s reach, your pup may think they smell good enough to eat. So, what can you use? Look for paper decorations that can be hung somewhere high and completely out of Fido’s reach. Also, consider switching out your normal dishcloths to more festive ones, that’s always a safe choice and cute update. Do you still want your house to smell like fall? Opt for autumn-scented oils instead of candles. Now that you know how to keep your dog safe, go on and enjoy the holiday! Happy Halloween everyone! 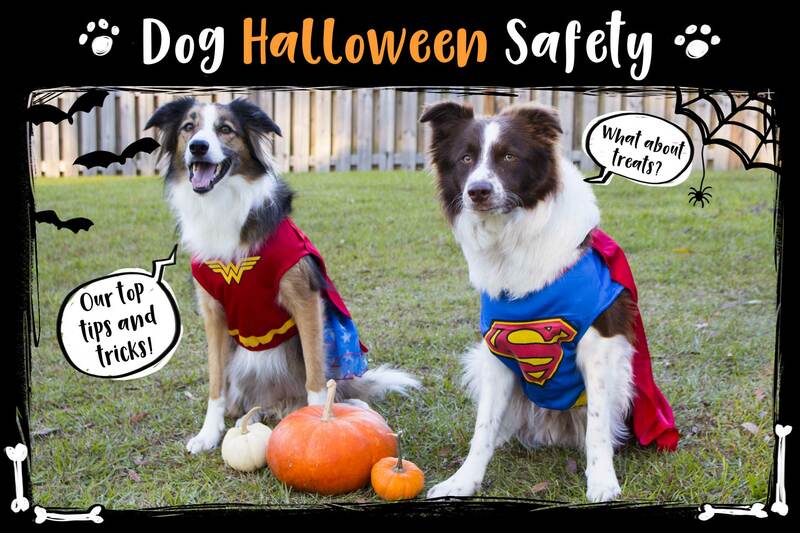 Do you have dog safety tips for Halloween or any other holidays? Please share them with us so we can let others know!